So, you just made your first website and now you want to attract your first visitors. Lack of traffic is the biggest reason that blogs and websites fail. You want to create something people will read! We wanted to put together a resource of traffic generation strategies that are simple to implement and can help you attract website visitors for free. There is no such thing as free instant traffic, but if you take action and implement some of these suggestions and stick with them you will notice your traffic numbers pick up (see how to track your website visitors) and begin to snowball, generating the results that you desire. We present you with 25 ways to attract your first website visitors for free. 1. Comment on industry blogs with heavy traffic. One of the quickest ways to send highly relevant traffic to your website is by commenting on blogs within your industry that are extremely popular and have high traffic numbers. When you leave a comment on a blog post the majority of comment systems will allow you to input your own URL along with your name. This makes it possible for individuals reading your comment to click on your name and be taken to your website. It is important to leave insightful comments and build up a reputation of leaving useful information. You don’t have to be overly promotional to attract referral traffic, so concentrate on posting helpful comments. 2. Share your content on social media and use hashtags. Social media gives you a free platform to share your website content, so make sure that you take advantage of this. It is important that you identify the best social media accounts to use for your audience and focus on these, rather then spreading yourself too thin and wasting time promoting on a social platform that your target audience doesn’t participate on. You need to use the social media platform of your readers’ choice, not your own. Try all of them and see what gets traction in your niche. When you share your content on social media make sure that you include a few hashtags that describe what your content is about. For example, if you have a blog about fitness and you are sharing a post about diet tips you could include the following hashtags: #fitnesstips, #diettips, and #healthyeating. Many people search social media using hashtags, so it is a great way to introduce new readers to your blog and website. 3. Submit your blog posts to Reddit. Reddit is a social networking service where registered members can submit content, such as text posts or direct links. Users vote content “up” or “down” to organize the posts and determine their position on the site. Reddit is a great source of free website traffic, as long as it is relevant and not spammy at all. The Reddit community can be a great tool for website owners that share high quality content, and a complete nightmare for those that attempt to use the community to spam. Reddit users are a different breed of internet users so don’t try to slip something by them; they will shoot down spammy content faster than you can post it. Find a sub-reddit (/r) related to your content and share the blog post title and URL. If it is great content then you can expect a lot of up votes, comments, and website visitors. 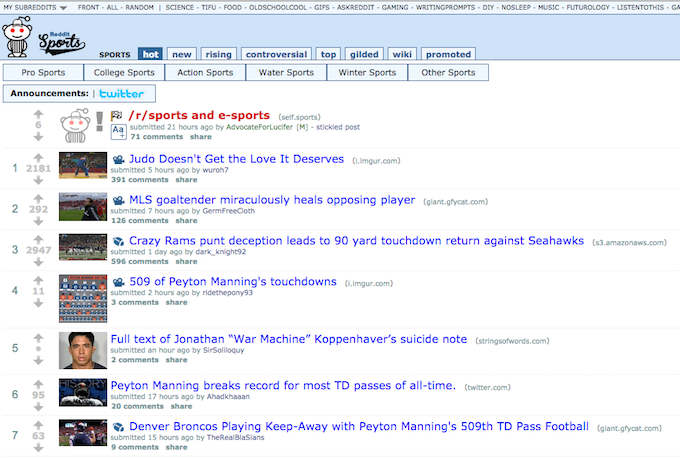 Take a look at the example below, taken from the /r/sports sub-reddit. The top post has received over 2,100 up votes and has almost 400 comments after only being posted 5 hours ago. Imagine how many people clicked through and landed on the website where the original content sits. 4. Conduct interviews with popular bloggers in your niche. This traffic generation tactic severs two purposes. First, it gives you a good interview to publish for your readers. Second, it is a great way to attract visitors that follow your interview subject. Conduct your interview and publish it on your website. Once the blog post is live reach out to your interview subject and let them know where they can read it. Bloggers love attention and they will be sure to let their readers and social media followers know that they were interviewed, and often times they will share the link, driving traffic back to your website. Not every blogger is going to jump at the opportunity, so don’t get discouraged if the first couple that you approach turn down your request. 5. Become a contributor on an authority website. Identify the most popular websites in your industry and contact the editors and offer to contribute a one off piece or even a regular column. Many websites don’t have the budget to hire a full staff of writers, so they rely on contributing authors to provide their content. In return you receive an author bio and a link back to your website. Once you build a readership you will notice your referral traffic numbers begin to increase. Every contributor post that you publish is an opportunity to attract new website visitors to your website for free. 6. Be active on forums. Forums within your industry that are active present you with a great opportunity to attract free traffic. The majority of forums will allow you to place a text signature in your profile that is displayed after each of your replies. Most high quality forums are heavily moderated, so take your time to contribute well thought out replies and insight in order to meet the post count requirements for a signature link. Some forums will turn into life-long traffic referral sources, so take your time introducing yourself and your website to the community the correct way. 7. Add your blog to Alltop. 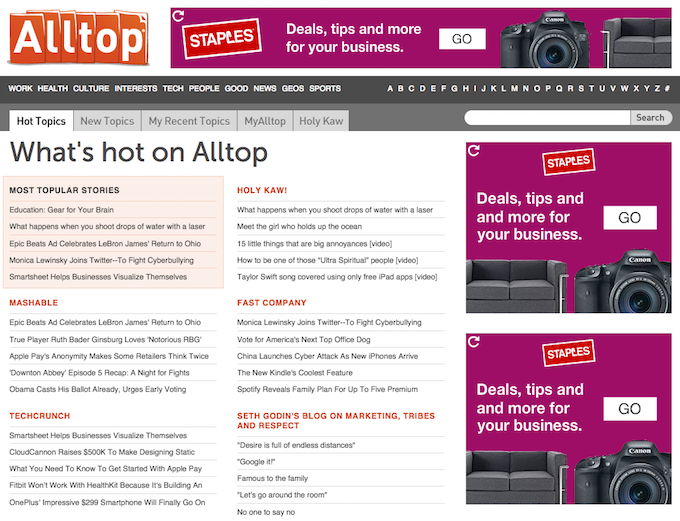 Alltop is a very popular aggregator for a wide variety of website content. Several websites and bloggers will look for content to share with their readers and media outlets will often look for news worthy information via Alltop. You can quickly add your blog feed under the correct category and attract new website visitors as well as inbound links. It is free to register your blog and you will be notified very quickly whether or not they have accepted your blog. While they do have a quality control department that manually checks every website, you will be fine as long as your content is original and high quality. 8. Create blog content around long-tail keywords. Publishing blog content that is optimized for long tail keywords is a great way to attract organic search traffic. As you begin to publish content on a regular basis and attract inbound links, your website will gain authority and strength. Once the search engines identify your website as a trustworthy source of content it will be easier to rank your content in the organic search results. Targeting long tail keywords with low competition is a great way to start to attract visitors. Make sure you include your target keyword in your blog post title and throughout the actual content of the post. You can read more about basic SEO here. 9. Notify bloggers when you publish great new content. Start to create a list of popular bloggers within your industry and manually reach out to them every time you publish new content. You can email them or send them a Tweet to let them know that you have a new blog post you think they might enjoy. A simple, “Hey check out this new blog I just published. I think you might enjoy it!” will work just fine. Not only might they tweet out the link to their followers, but they might also link to your content in one of their future blog posts. So, you attract free traffic and also introduce a new audience to your blog. YouTube is the second largest search engine, right behind big brother Google. Creating videos and including a link to your website in the description is a great way to drive new traffic to your site. You don’t even have to technically create new content for this to be effective. Several websites simply do a recap, turning their blog posts into video commentary. This gives you another version of content to market and can attract new visitors that wouldn’t have come into contact with your website otherwise. When you create your video titles and descriptions use long tail keywords to increase your chance of being found in the organic results. 11. Join relevant LinkedIn and Facebook groups. Facebook and LinkedIn groups are great for networking and building relationships. Along with these relationships come website visitors from those people that you begin to interact with. Curiosity drives most of the traffic in these groups. Find relevant groups and if you feel that your website content would benefit the members of the group don’t be shy — share it! These groups have been hammered with spam in the past, so they are quick to identify group members that are there solely to spam their websites. Share information and join the discussions so the members know that your intentions are genuine. 12. Include mentions in your tweets related to your blog posts. When you share your blog posts on Twitter make sure that you @ mention any brand or individual that was included in your post. Twitter makes it very simple to alert someone that you have mentioned them. If you tell someone that you mentioned them or their brand in a post they are naturally going to want to check it out. Now, if they land on your content and like what they read they are going to be likely to share it with their social audience and maybe even mention your post in their content as well. 13. Link out to other relevant blogs. Linking out to relevant authority websites is great for SEO, but it can also help to attract attention from the websites you link to. Most larger websites have a dedicated team that monitors their link activity. If they notice that your website is mentioning them they are more likely to return the favor at some time. This is a strategy that can help your website get noticed by someone that wouldn’t have even known your site existed without linking to them. A single link on a large website can drive more traffic that you ever imagined, and continue to send traffic daily long after the link is published. 14. Check HARO requests daily. HARO, or “Help a Reporter Out” is a service that matches reporters with experts. Anyone can sign up for a free HARO account and reply to media requests. After you sign up you will receive 3 emails daily that contain media requests related to your area of expertise. There are several categories to select from and every time you provide feedback to the media contact you have a chance to receive press and a possible link back to your website. This can help to brand you as an expert, and receive high quality links and traffic to your website. 15. Make sure your posts are properly optimized. Every single blog post that you publish is an opportunity to attract organic (free) search traffic. There are several on-site optimization tips that you can use to help increase the visibility of your content in the search results. Making sure that your URL structure includes your post title, using target keywords in H1 and H2 tags, using alt-image tags, and writing descriptions with an effective call-to-action are all things that you can do to help improve your on-site optimization for each post you publish. For more information about on-site optimization check out this blog post (http://moz.com/learn/seo/on-page-factors). 16. Accept guest posts on your blog. Accepting guest posts gives you access to free content as well as authors that will be eager to share their posts across their social media channels, introducing your website to a new audience of website visitors. It is important that you only accept guest posts that are high quality and don’t feature spammy outbound links. Make sure that you ask for several writing examples prior to accepting a guest author. Many people will guest post because it gives them an opportunity to earn links, and that is fine, as long as they are linking to high quality websites. Focus on high quality guest authors and you can see a nice increase in traffic. 17. 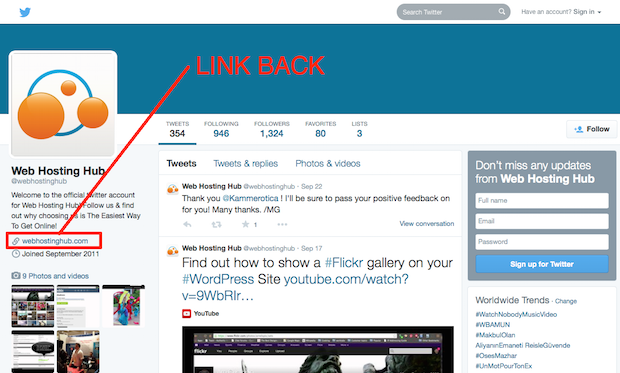 Link back to your website in your social media profiles. Whether it is your Twitter, Facebook, Pinterest, or one of the other popular social media profiles, you have an opportunity to link back to your website. As your social media following increases more people will be exposed to your profile. Having a visible link to your website gives those that are interested in learning more an easy way to visit your website. For an even higher click through rate include a call-to-action in the description next to the link. Look at the image below of Web Hosting Hub’s twitter page. You will see that they have a link to their website in their profile, allowing consumers that found them through social media to quickly visit their site with a single click. 18. Submit your blog posts to StumbleUpon. StumbleUpon is a website that helps its users find information relevant to their interests. When signing up, users identify topics of interest and then StumbleUpon presents them with random content based on those topics. Submitting your blog posts to StumbleUpon is an easy way to get more people to read your content. For example, if you had a blog about sports your posts would be shown to StumbleUpon users that selected “sports” as one of their interests when signing up. Getting started is free and you can have traffic on your website within minutes. 19. Start your own Facebook group. Starting a Facebook group allows you to create a targeted group of individuals that all share the same interest. There are secret, closed, and public groups. For traffic generation purposes you will want to start a public group that anyone can join. This allows you to post updates, such as links to your blog posts, for all to see. You want group members to visit your website and you also want them to share your content with their social media connections to expand your reach. 20. Post fresh content frequently. Updating your blog content on a regular basis signals to the search engines that your website is a good source of information. It also gives your website visitors something new to read every time they visit. Every site is going to have a different posting schedule. Some might only need one new post a month while some require new content multiple times a day. The key is to be consistent. So, if you determine that you need a new blog post daily make sure to stick to that publication schedule. The last thing you want to do is get your audience used to a certain content schedule and then pull back on your post frequency. They will lose interest and find another website to visit on a regular basis instead of yours. The more frequently you post, the more times your content will be shared, attracting new traffic. 21. Interlink your blog posts. The strength of your domain isn’t based solely on how many websites link back to you. Interlinking your blog content not only helps to improve your SEO but it also gives your visitors a better user experience, which is a foundation for improving traffic. Interlinking blog posts is a great way to help your visitors find additional content that interests them. This keeps them on your website longer, but it also increases the chance of them sharing your content on social media. This places your content in front of a new audience, drawing in new visitors. Think of an interesting topic in your industry and reach out to a couple dozen authority figures, asking them for their feedback. Then, gather all of their responses and put together a huge roundtable blog post. Make sure to link their names back to their Twitter profiles and also include the name of their website linked back as well. Once you publish the post let them all know that it is live, and sit back and watch your traffic numbers soar. Since they are presented as an expert on the topic they will want to share it with their social media, instantly driving traffic to your website to read the post. 23. Write compelling titles and descriptions. Just because your content ranks high in the search results it doesn’t guarantee visitors. Compelling titles and descriptions attract clicks, not just rankings. You should be writing your titles to include your keywords, so if someone performs a search with a particular keyword in the title they will be likely to click on that result. While the description doesn’t provide any SEO value, it does contribute to the click through rate. Make sure your description explains the value of the post. Why should they click on your content over the other results on the page? Make sure your description clearly defines that. 24. Negotiate a banner exchange. A banner exchange between your website and another blog within your industry is a great way for both website to attract new visitors. Reach out to blogs that you feel are high quality and wouldn’t mind be associated with. Offer to place a banner on your website promoting their site in exchange for a banner on their website. Make sure you both agree on the banner location ahead of time. It will be difficult to get the larger websites to agree to this because your website won’t be able to provide the same traffic value that theirs does in the beginning, but don’t let that discourage you. Negotiating exchanges with some smaller websites is still beneficial, because in the beginning every single visitor you can attract contributes to your growth. Register a Yahoo! account and participate in their “Answers” program. This is a Yahoo! community program that allows users to post questions as well as answer questions. 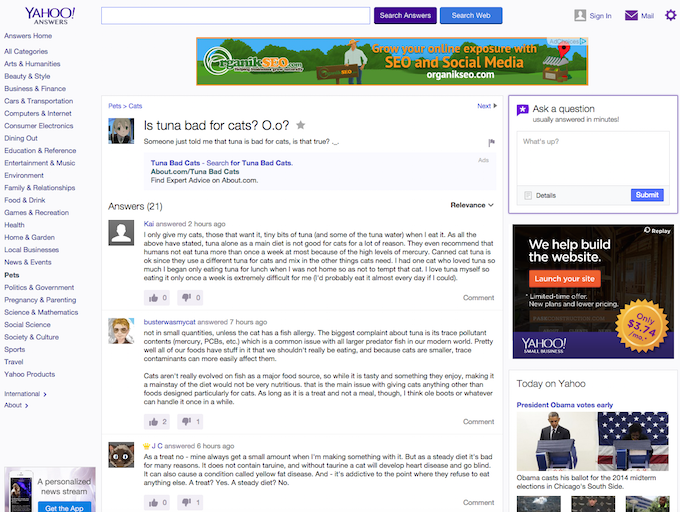 In the example below you can see that a user had read that tuna is bad for cats so they posted the question to receive feedback from fellow Yahoo! users. The question quickly attracted 21 answers, all designed to answer the question posted. If you become an active participant, answering questions related to your industry gives you a great opportunity to drive traffic to your website. It is important that you answer a handful of questions without promoting your website or posting any links. After you accumulate some time and answer some questions you can answer related questions and also add things like, “I actually wrote a blog post about this topic that you can check out HERE.” and link your blog post. Yahoo! Answers can attract a lot of high quality traffic, so we highly recommend including it in your initial traffic generation strategy. As you can see, there are plenty of ways to start attracting traffic to your website for free. While it does take time and effort, these are all viable methods to start building your traffic. Every website has to start somewhere, so try a few at a time and see what ones produce the most visitors for your website. Great to hear your views Nyk! Thank you so much from the bottom of my heart for this amazing post. This is a Great site for sure. #10. How to turn a blog post into a video commentary.. (any site or tool) Could you help me ?